Hate headaches? The distress you feel is not all in your—well, head. People consistently rate pain of the head, face, eyeballs, ears and teeth as more disruptive, and more emotionally draining, than pain elsewhere in the body. Duke University scientists have discovered how the brain's wiring makes us suffer more from head and face pain. The answer may lie not just in what is reported to us by the five senses, but in how that sensation makes us feel emotionally. The team found that sensory neurons that serve the head and face are wired directly into one of the brain's principal emotional signaling hubs. 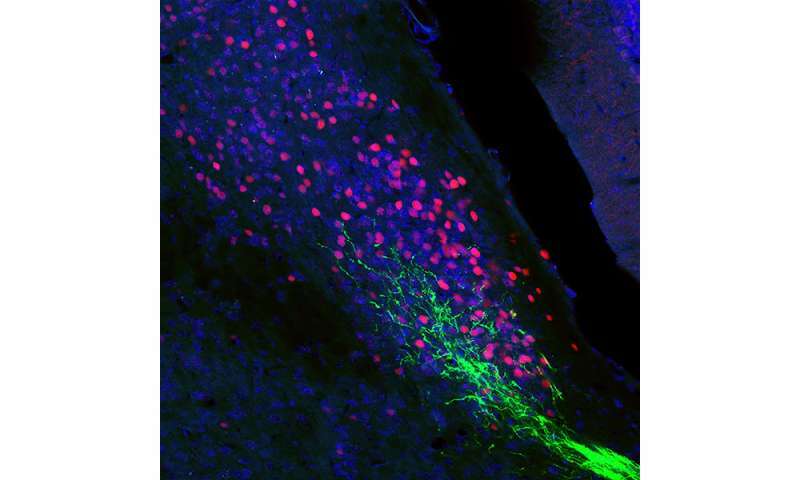 Sensory neurons elsewhere in the body are also connected to this hub, but only indirectly. "Usually doctors focus on treating the sensation of pain, but this shows the we really need to treat the emotional aspects of pain as well," said Fan Wang, a professor of neurobiology and cell biology at Duke, and senior author of the study. The results appear online Nov. 13 in Nature Neuroscience. Personal accounts of greater fear and suffering are backed up by functional Magnetic Resonance Imaging (fMRI), which shows greater activity in the amygdala—a region of the brain involved in emotional experiences—in response to head pain than in response to body pain. "There has been this observation in human studies that pain in the head and face seems to activate the emotional system more extensively," Wang said. "But the underlying mechanisms remained unclear." To examine the neural circuitry underlying the two types of pain, Wang and her team tracked brain activity in mice after irritating either a paw or the face. They found that irritating the face led to higher activity in the brain's parabrachial nucleus (PBL), a region that is directly wired into the brain's instinctive and emotional centers. Then they used methods based on a novel technology recently pioneered by Wang's group, called CANE, to pinpoint the sources of neurons that caused this elevated PBL activity. "It was a eureka moment because the body neurons only have this indirect pathway to the PBL, whereas the head and face neurons, in addition to this indirect pathway, also have a direct input," Wang said. "This could explain why you have stronger activation in the amygdala and the brain's emotional centers from head and face pain." "We have the first biological explanation for why this type of pain can be so much more emotionally taxing than others," said Wolfgang Liedtke, a professor of neurology at Duke University Medical Center and a co-author on Wang's paper, who is also treating patients with head- and face-pain. "This will open the door toward not only a more profound understanding of chronic head and face pain, but also toward translating this insight into treatments that will benefit people." Chronic head-face pain such cluster headaches and trigeminal neuralgia can become so severe that patients seek surgical solutions, including severing the known neural pathways that carry pain signals from the head and face to the hindbrain. But a substantial number of patients continue to suffer, even after these invasive measures. "Some of the most debilitating forms of pain occur in the head regions, such as migraine," said Qiufu Ma, a professor of neurobiology at Harvard Medical School, who was not involved in the study. "The discovery of this direct pain pathway might provide an explanation why facial pain is more severe and more unpleasant."